The ACON Air 4.6 Trampoline is perfect for families large and small, as this trampoline has no single user weight restriction, due to its exceptional build quality and material. 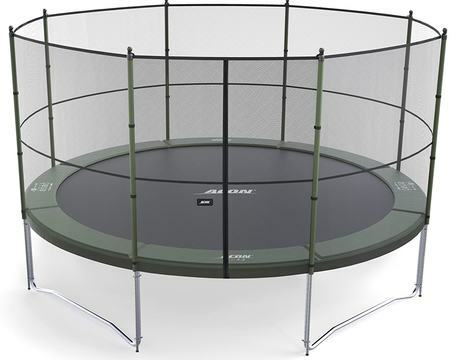 The ACON Air 4.6 Trampoline is a 15 foot diameter trampoline. This ensures plenty of jumping space so you can do all kinds of cool tricks and gain major air. The trampoline is 36 inches high, and weights a total of 295lbs. The jumping mat is made from six time cross sewed polypropylene UV treated material. The UV treatment is really important, because it makes sure the jumping mat will last for years. The frame pipes are made of galvanized steel. Being made of galvanized steel ensures that the frame will never rust, making the ACON Air 4.6 Trampoline extremely durable. Also, helping with the durability is that the fact that the frame pipes have a diameter of two inches and a thickness of .08 inches. This makes the frame stable and safe for all jumpers. The legs on the frame are in the U shape configuration. The final main component for any trampoline are the springs. The springs for the ACON Air 4.6 are made from 110 gauge galvanized steel and are 8.5 inches long. The springs being this length allow for a lot of bounce back, so you can get great height on your jumps. As in added bonus they include a spring puller tool to help make installing the springs a breeze. Just attach on end of the spring on the inside hook of the jumping mat, and the other end onto the spring pulling tool. Then you just have to pull the spring and connect to the frame. The tool helps keeps your fingers away, and prevents injuries. The enclosure is made of top quality material as well. It has poles that extend up from the legs, and at the top of the pole is a solid ring which the net hooks to. The net then comes down and hooks inside of the spring area, extremely close to the jumping mat to make sure there is no space for fingers to get into the springs. 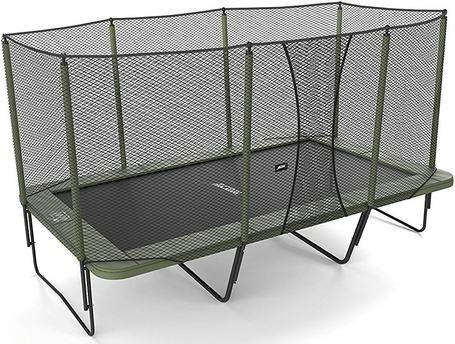 Also, to prevent fingers from getting into the spring the ACON Air 4.6 Trampoline, includes a high quality pad to cover the springs. This extra added protection makes it so no one will get hurt. 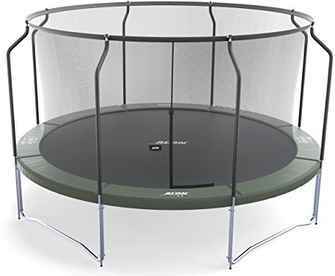 Another great trampoline from ACON is the ACON Air 16 Sport trampoline with enclosure. Is has the same quality and features of the 4.6 but the dimensions are 16 ft x 9 ft. It includes 138 heavy gauge galvanized springs and now a ladder.